While I hate to admit it, I spend way too much time sitting each day. Don't get me wrong, I love my day job as a writer, but it does do a number on my back if I decide to work upstairs on the couch, or in a chair that doesn't properly support my back. Since I spend so much time sitting, I knew I had to do two things to properly take care of my back – lose weight, and find something to properly to support my back while I'm on my laptop. While I have been adding exercise to my routine, I was struggling to find the perfect back support that actually worked for me. Eventually, I found something that caught my interest – the Qi Orthopedic Pillow. 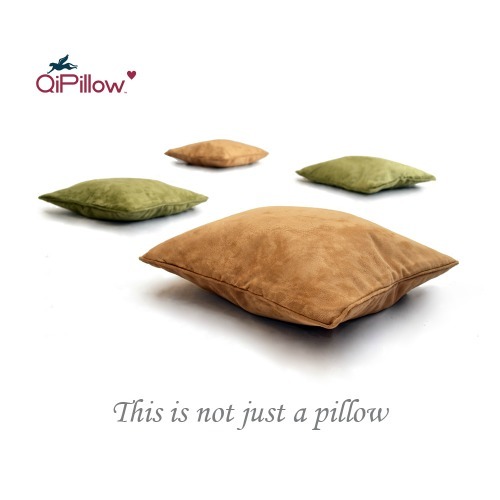 Wanting to learn more about the QiPillow, I reached out to the company, who was happy to send me a complimentary pillow for review. From first glance, the QiPillow seems just like any other pillow. What makes it unique is the pillow's air-controlled orthopedic core. By blowing air into the pillow (or using an air pump like I did), you can inflate or deflate the actual pillow itself to adjust the pillow to your own needs. This can help prevent muscle fatigue in your back, or in other words, prevent back pain for anyone who sits in a chair long periods of time. With the air unit, it is also very easy to store, allowing you to keep it in the back of the car, or in a drawer in your office! Having slept on an air mattress and used air pillow before, I felt I had a good idea of what to expect from this pillow. I must admit though, it surprised me. Part of what makes this pillow so comfortable, at least in my opinion, is the extra lining inside the cover of the pillow. This creates an extra padding layer between the air unit and the actual green cover itself. Since the pressure in the pillow is controlled completely through air, you deflate or inflate the QiPillow to your comfort, making it usable by just about everyone! So far, I have had no complaints with the QiPillow. This pillow is easy to use and actually feels quite comfortable on the small of my back. Now, this may not be the most comfortable pillow for sleeping, but this pillow is designed for helping with posture and back pain, not solving all your sleep problems. Since it is so easy to adjust, I can see this being useful when watching a movie, in the office, or during a long drive. Based on my own experience, I am happy to give the QiPillow an A- rating. This only reason I can't give it an A rating is I"m not thrilled with the microfiber fabric. I would much prefer something that is 100% cotton or a similar natural fiber. Want to try the QiPillow out for yourself? You can currently purchase this orthopedic pillow on QVC or on Amazon.com. At the time of this review, QVC is running a special on this pillow for $25.88 + $6.88 shipping and handling. Currently, the only choices in colors are camel and sage (the color featured in this review). Disclosure: Budget Earth did not receive compensation for this review but did receive free product for review purposes via Tomoson.com. Only admins see this.">nofollow. All opinions on this product are my own and may differ from our readers' opinions. Would you like to have your products featured in a giveaway event? Want to increase your social media exposure before the holiday season? See how we can help! Contact susan.l.bewley@gmail.com to see what we can do for your company! Boy could I use that! As my husband puts it I'm barely 100 pounds and when I sit on a hard chair I get sore. Daily I currently use two sofa cushions and a bed pillow to sit on. Not very comfortable. My husband suffers terribly in the car – this would be perfect for him. Love the fact you can adjust pillow to your own needs. What I like about these pillow is that it looks comfortable and soft. It will really help my sleeping because lately no pillow would make me sleep comfortable. I have bought over 5 pillow since this month and still none works well for my neck. I absolutely love that each person can inflate or deflate the pillow to best meet what makes them most comfortable. I would use one of the these pillows all the time for my neck problems. Great review! It's adjustable? That's fantastic! I've never tried any kind of air pillow for my back, but I bet this would help. Thanks! I love that you can easily inflate or deflate it to adjust the desired support. I would like this for my computer time, because I like to put a pillow under my mouse controlling arm and it's never quite the right size pillow. I like that it can be adjusted to everyone's needs. I'm curious about trying an air pillow myself, I must admit I've never heard of them before. Maybe they can change the material to cotton based on your and other people's reviews. wow, i love that these support your back, I work at a desk so my back and tailbone hurt quite a lot, especially my lower back. I can feel my back pop when i walk. I think this pillow could help to aleviate this! Thanks for sharing! I love the fact that the pillows are orthopedic! I have a bad back and this would help so much! I have Tailbone Coxxyx Pain, so I don't sit very often, but I lounge quite a bit, this Pillow seems like it would be perfect for me to use when I am in Bed on the Laptop to prop up my back. I would love to try this pillow a shot on my deskchair, because I see myself sitting on the edge because my back isn't supported. I like that it will help support my back better than other pillows. It's great that we can adjust the level of support to personalize it to our back!. We could use a pillow with varying support in our house. I did not read anything about care. Is it washable?? I should have mentioned that! Yes, the cover itself is washable. You will just have to take out the plastic air unit. I don’t think that would be very dryer friendly! I have sciatica, it would be cool to try! Thanks! Having back problems myself, this pillow sounds awesome. Being filled with air which makes it adjustable to each individual sounds very interesting and unique. I also spend way too much time sitting!! Love that you can adjust to your own needs, not just for different people to use but also for different situations! The couch in our family room is not comfortable for watching a 2 hour movie. I much prefer sitting up in bed to watch a movie. This would be perfect for this. When I'm rich & famous I would love a craftmatic adjustable bed….but for now the air adjustable QiPillow will do the trick for comfort while sitting up in bed. I have had 2 back and 2 neck surgeries so when I sit in a chair I need support badly for the low back. 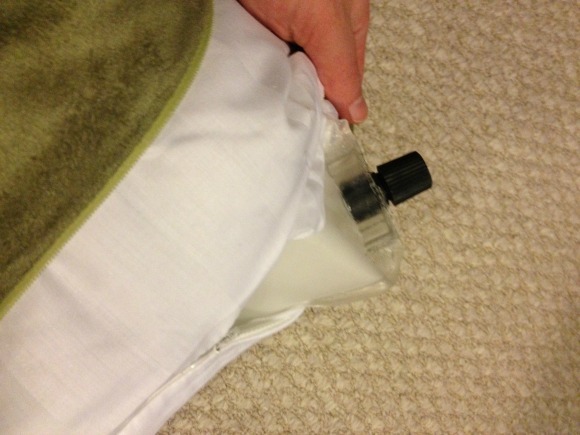 I like the idea that you can adjust the pillow through inflating and deflating with the air. I would also like to use it in my car. I had never heard of this pillow before, so I was interested in reading your review. It sounds great since it is adjustable for support. I also appreciate you telling what you don't like about it – the micro-fiber cover. I would think it would be easy to make an all cotton (or whatever fabric you choose) cover for it. That would be good for keeping it clean as well as having whatever color or pattern one would want. Thanks for your review! That is such a good idea! I have to always be careful since my husband is allergic to polyester! I love that you can deflate & inflate to your individual needs! I also love that it molds to your back while sitting for long periods of time!! This pillow would be great for me at work. I sit at a computer all day and our chairs do not have great lumbar support. I have constant lower back pain. I definitely have to give this pillow a try! I have a bad back and neck and this soudns like it would be perfect for me. We could really use a couple QiPillows here…lol…one for me(had a spinal fusion years ago-traded one pain for another)and one for my hubby to use when he is working.Sounds like what we have been looking for.Thanks for a great review! I have RA and osteoarthritis. I have pain everywhere when I sleep and I have yet to find something that helps. I have a lot of hope that this product might help me! Thanks for a great review and giveaway! I really have to say that I could really use this, I suffer from lower back pain, I love how this Qipilllow conforms to your problem area ( would be great for my back when I'm sitting for long periods of time ) I also love how you can deflate this when it's not being used and store it! I am absolutely fascinated at the idea of a pillow being used for back pain that is "powered" by air! I sit way too much, too. However, I'd probably have to fight my husband for this if I got one. I really like that this pillow can be adjusted to suit individual needs. I think it would be great for my SO, he spends a lot of time in an office chair that isn't the most comfortable. I think one of these pillows would also improve sleep for both of us. Thanks! I am always hot while in bed/sleeping no matter if it's summer or winter. I am always finding myself waking up to flip over my pillow to the "cool" side! So this would def be perfect for me and my husband! I'm petite and always have to use a pillow when I seat. I like this pillow because I believe it would help me squirm less because it conforms to the body unlike regular pillows. I like the fact that it's adjustable to fit you personally to whatever you're using it for! Thanks! I love how you can customize it with inflation since everyone's preference in pillows seems to be different. My husband would love one of these since he sits at a desk all day for his job. Great review, thank you! I really like the adjustabiity aspect of the QiPillow using different amounts of air. This seems to be a product that would help me quite a bit with lumbar support and long car rides, both of which aggravate my lower back pain. Thank you for sharing this review! Love the inflatable part of adjusting the QIPillow and how it looks like ar regular throw. plilow when not in use, that would not be offten. I do scrapbooking & card making so I sit most of the day! I'm getting sciatica from sitting improperly during the day. I really need more lumbar support. The pillow sounds simple but I can see how it would work. Interesting design. Sounds like it would be nice on the long car rides. It would be nice to get out of the car with a relaxed back. This pillow sounds like it is something my back would enjoy. I have a back injury and being able to inflate and deflate the pillow to find my comfort level would be great when I sit in a chair. I like the idea that it can be deflated for easy storage or even to take along when I travel. Thank you. I really love that it supports your back and helps your back when sitting. Although I stand at work when I get home this would be nice to have to help my back. I like the idea of it being adjustable. Comfort would depend on where you are using it such as office chair, couch, car etc. Each seating situation would be different and would therefore require different amounts of air to make you comfortable. I would love this pillow. I have lower back issues and lots of neck tightness, due to stress. The pain effects all aspects of my day, including my sleeping. This pillow looks promising. Love the fact that I can adjust the air in it to my comfort level. That keeps it consistent also! I love that I can purchase additional pillows at Amazon. I would like to buy a bunch of these for my couch and oversized chair but have the option of storing them easily, too. I have lower back issues from several auto accidents and nothing has ever really worked, The idea of inflating it to the perfect fit is revolutionary! I would love to win this pillow, maybe the back fatigue would let up a bit. I like that this pillow is not a one-size-fits-all product because the air pressure in the pillow can be controlled by the individual user to suit the needs of their specific sitting position at any given time. Sounds like a win-win to me! 🙂 This pillow would be great for my mom when she travels to visit me. She lives 3 states away from me and the long drive kills her back. I think this pillow would help her out a lot! I love the fact that this helps with back pain and being adjustable! I would love to try these pillows. they look so soft and confortable. i love that you can adjust it for the persons preference. me and my husband have back pain and i really need to improve my posture. i slouch way to much. I love that these pillows are controllable as far as firmness and/or softness are concerned. I like that they have an adjustable orthopedic core…. and that they are great for lower back pain. I have issues occassionally…… but my husband suffers regularly….. I would give this to him! Thanks so much for another amazing giveaway! I also spend a considerable amount of time at my computer. My chair has really no back support at all I get sciatica too frequently. This makes the pain much worse. I know a pillow such as this one will ease my pain. I suffer from chronic back pain and have tried a number of pillows as I try to find some relief. I have yet to try a pillow with an air core. The QiPillow sounds like it may do the trick. Thanks for the review. I hurt my back in April and have been in significant pain since then. I think that this pillow may help alleviate some of my pain. I like that you can control the firmness. I really like the air unit feature so it can be individualized to your own needs. I also like that you can take it anywhere, which is nice when you have to go out of town in a jeep for a Doctor's visit or to visit the inlaws. Long drives are killers for the back. I love that it's adjustable! It looks and sounds so comfy! I really like the fact that this pillow is adjustable. It is also awesome that when not in use, not only does it look like a throw pillow but can also be deflated for easy storage. What agreat idea! The customization feature seems so obvious, but I've never seen it before. I would love to try one of these pillows. I have found nothing that alleviates my lower back pain. I think that these pillows would bring much help to my husband and I because we both suffer from Arthritis they would be a great help in relaxation and comfort. This pillow sounds wonderful. I really like that it is filled with air. That way you can adjust it until it feels right on your back. Which I think would really work well on my back. I hate to admit it but I spend a lot of hours on my laptop on the couch. Becuase of this I have a very stiff neck all of the time and lower back pain. I could really use this pillow – maybe then I would sit in the chair! It would also be nice to use in he car. The thing I like most about this pillow is that it is adjustable to each person's needs. It is like a sleep number bed for your back!!! More than one person can use it, and they can conform it to what they need for their situation. Perfect! Did not know that you could adjust the pillow and how it seems comfortable – or that you can adjust it for you and your back. Both my husband and I need one. Especially my husband, whose new job requires more car traveling – so this would be perfect, thanks! I love that these aren't filled with memory foam. That stuff is actually pretty toxic. It's also nice that you can just deflate these and store them easily. My husband likes to switch between pillows, and it gets tricky trying to find a space in the closet for them. I like that you can adjust the pillow. How cool. I love these pillows! Fantastic. I love that you can deflate them. I have much back pain and spend most of my day sitting as well. I have never heard of this pillow before. It is something I am going to have to check into. Thanks for the review. This pillow looks very comfortable and like the fact that it will adjust to your back. I would love to have one of these while watching tv. This cushion would help me so much when I use my laptop. I sit on the couch with my feet up and my back bothers me. This certainly seems to be just what I need, what a great idea. I think it might just be the thing to help prevent the dull lower back pain that I get when I sit in one position for too long. This sounds like a great pillow. I have disk degeneration and a compressed disk, so this would be great for me. I really like that you can adjust the amount of air in it. Which would come in handy depending on were you are using it. Thanks for the review. I love that these pillows can be adjusted to the individuals prefrence. This is such a no brianer, I can't believe working in an office I have never heard of this! Every one should have one! This could be really great for squishing down to travel with-driving makes me really tense, especially when the seat doesn't support my back. the pillow looks wonderful! I am a disabled woman with severe back problems. I need a quality pillow to offer some back support and would love to try out this product! I don't have too much of a back problem but my husband got into an accident by work(hit by a tow motor) and his back has given him problems ever since. He definitely needs this. I like that it can be adjusted to my individual needs and it also makes for handsome decor! I really have to say that I could really use this, I suffer from lower back pain, I love how this Qipilllow conforms to your problem area. Also, I love how you can deflate this when it's not being used and then store it. I think it would really be nice for my neck, when I'm sitting in my chair watching tv, doing crafts, or just on my computer entering contest like this one. thank you. These pillows would be awesome for me. I have major anxiety and insomnia, and cannot sleep. I am epileptic, and I believe these pillow would help me relax. This pillow sounds like it would really help me with my chronic lower back pain. I sit all day at work and my back is aching by the end of the day. QiPillow can be filled with air to suit your comfort level each day. I also think it would be great in the car. After about an hour in the car I'm ready to get out and stretch my legs and back. I think the QiPillow would make traveling much more pleasant. My husband and I are retiring in January 2014, and plan to travel around the U.S.. I believe the QiPillow will make the journey as pleasant as the destination! Hello. I have a lot of back pain when travelling. This sounds like it would be quite handy. But, I am kinda concerned about leaving it in the car, with the heat. Might affect the plastic? Thanks. Vicki. I have a lot of back pain, especially when sitting in the car for extended periods of time. This would be a great product for me to try as i could adjust for my level of relief. Wow and what beautiful pillows i love them and could really use them to support my back as i am a avid internet fan.I must say i am really sold on these pillows and thank you so much for giving me the chance at winning them and may god bless you and keep you in his grace. I like the pillow's air-controlled orthopedic core. Being able to inflate or deflate to get it perfect is an amazing feature. This would be great for the office since I spend most of my day sitting at my desk. I like the way the pillow is adjustable with the pump. I also like that it can be stored in a small space, so that I can use it on car trips and take it to the office also. I have very bad back pain and have to go to the chiropractor often, this pillow seems like it would be very useful to me. Because I sit for most of the day, I could really use this. The QPillow is a nice size, conforming to any body shapes . The choice of color of the soft zippered covers for cleaning is important to me. Having Lupus, one of the most difficult things to find is a decent pillow to sit or lie down with. I love that these pillows are adjustable with air, because each person needs a different amount of support, and each day my pain is different meaning I need a different level of support. I really love this product! I am nine months pregnant. I would love to have back support right now. I like that it is easily portable and adjustable to fit individual needs. This sounds fantastic. I suffer from a herniated disc in my lower back and I am always having some sort of pain. This would be wonderful to try. I like the fact that you can adjust the air. I was a little curious though if you could wash the cover. I love the fact that I have the ability to change the firmness of the pillow. Sometimes I like to be flatter when sleeping and sometimes (especially when I have a cold) I like my head higher up. I love the fact that you can just blow into it and adjust it to your comfort level. I am a huge fan of QVC so I will be checking it out. I would love to use this at home and in the car to help with my back pain. I love the fact that the pillow is orthopedic and has great support! Also the fact that it is adjustable makes it even more desirable! Great review, thank you! Looks like a great product,very useful in my life right now,thanks for the opurtunity. This pillow looks great! I didn't know that they made pillows with air chambers in them! My husband and I have a Sleep Number bed and we love it for comfort. Having a pillow with the same customizable support would be wonderful. Thanks for the info! I love the fact they are adjustable. I have cervical stenosis and RA and have to maintain proper posture to aleviate my pain. The pillow is orthopedic and recommended for those with joint/muscle issues…I think they are made amazing and look to last a long time…Who out there doesn't have neck pain or headaches is rare..Can't wait to try one.. Awesome honest review! ….. I like the fact that it has a microfiber cover to it 🙂 Microfiber is soft and feels comfortable on the skin. I love all the different colors choices as well! But, what I love most about the QiPillow is that it is easily adjustable!!!! This is a BIG plus for me!! No matter if I am laying on the floor or sitting on a chair or the sofa I can adjust it so that it is just the right comfort level to help reduce the stress on my back. After taking care of little kids all day it would be a God send to be able to have this pillow to relax with. I also suffer from neck pain as well and I like to use a pillow behind my head when sitting up in bed or relaxing on the sofa … The QiPillow would be wonderful in helping reduce the stress off my neck as well. I can sooo picture my with my QiPillow tucked nicely under my lower back for support while I lay on the floor doing airplanes with my grand daughters …. Something I long to do, but can not now without getting up in pain. sounds perfect for use while I am working on the computer. My husband can adjust it the way he likes it and I can do the same. No more lower back pain! Thank you for the informative review. I really think these pillows would help me immensely, particularly for my neck. It seems like I can never find a pillow that makes my neck comfortable and I always wake up with pain. The ability to adjust it with my head already on it, sounds like it would work perfectly. These pillows are deflatable, so they're easily transportable. I could easily take it camping, or even on a plane. I really think this pillow would be wonderful for me as I drive to work and then pretty much sit in a chair all day. The fact that it is adjustable to your comfort level helps too so that I can actually find a comfort level. I have been avoiding surgery on my neck and back for 10 years but it has not been easy. I'm constantly switching pillows through out the night trying to relieve my pain. The QiPillow is intriguing but I have tried so many different types of pillows I'm a bit skeptical but would be willing to try after reading the review. This pillow sounds like it would be great for anytime you have to sit for long periods of time. I would probably want to use it while I am working on my computer or driving a long way. I Work From Home. A Lot of sitting for me, I am also Disabled so it would be a good thing for me to Use this pillow. From What I read It would bring me a great deal of comfort and I need that right now! My Back feels like a prtzel all the time. I love that you can inflate or deflate this pillow to soot my needs.I spend a lot of time sitting at my computer and I would love to try it to see if it helps my back pain. I love that you can controll how much pressure you need would be using this when I am on the computer. This would sure hbelp with my lower back pain. This pillow look so comfortable. I love the ability to inflate it myself to make it as firm as I want/need it to be. I can see that it could be an excellent back support. I love that these pillows are soft and luxurious. I often find myself resorting to the floor sometimes with my laptop because my chair can be so uncomfortable. These pillows would definitely help in the way of back support! I love how you can adjust the pillow precisely to your needs. Not everyone needs the same support! Both my husband and myself suffer from lower back pain and have tried just about every pillow on the market. I like that there is an extra lining inside the cover and that you can adjust the pillow to how hard or soft is comfortable for you. This sounds like the answer to my aching back's prayers. I too sit in front of the computer a lot as a computer operator. Currently I use three pillows to support my back. It is air concontrolled and available on Amazon and QVC. I like the idea of allowing the pillow to be adjusted to each persons comfort level. That is hard to come by even though a lot of companies try their best. Easy storage is great too. I love that you can adjust the pillow to your different needs (depending on what chair you're sitting in, etc.) just by letting air out or blowing it up more. And it looks just like a regular pillow too – blends right in! This pillow looks exactly like what i have been lookng for. I suffer from back issues and sitting at my desk with a conventional pillow isn't doing me any good. I think this would be amazing. I would LOVE TO try this pillow!! I love that you can add air and release air from it so that it fits comfortably to your body!! SO COOL! I'm a Virtual Assistant, which means I spend HOURS every day working at my computer. Unfortunately, my back pays the price for it! I think the Qi Pillow is an excellent idea. Plus, it's a goodlooking pillow, so if I have company/clients in, I don't have to hide it away! This would be perfect in my daughter's nursery. Actually, it would be perfect anywhere. I have terrible lower back pain since I am 5 months pregnant. I bet this would really help. I love how it customizable so I could use it and my husband too. This looks amazing! I wish i had heard about these sooner! Im sure it would be great with my scoliosis. I like that you can adjust this . I have bought so many pillows trying to find the right amount of puff. I also think it would then be great for traveling because yoiu could flatten it. I also would love using this on my sofa that is too deep for me to sit on properly so it hurts my back. what i like abt the q pillow is that you can change the size and level of firmness by just the amount of air used to fill the pillow. i like that it can be used almost anywhere you need extra support or comfort. This pillow looks awesome! I sit most of the day between sewing and running 2 online businesses, my back could use the support! I would love to try one of these! I love how it supports your back and it supports your back in the spots in needs supporting and how you can adjust it to your liking. Thanks for sharing. I would love to win one of these pillows. I have 'degenerative disc disease' and bursitis and tendonitis in both hips. There are about 3 or 4 discs that are either completely gone or just a little left. Also one vertebra is tilted (rotoscolosis). I hope the orthopedic doctor can figure something out soon because the pain is more than the morphine can handle now. I love that you can control how much air is in the pillow. I think I found my new pillow. I have Cerebral Palsy and my posture isn't the best so maybe this will help it. Nice that you can adjust it. You can buy all types of things out there that are all "one size fits all" types that help your back but this is the first pillow that I have seen that you make to fit you. My husband would love this after a hard days work or he could give it to his Nanny which has a really bad back right now after falling and is too old for surgery. I suffer from lower back pain due to bulging discs and occasional Sciatica. The fact that this pillow is adjustable makes it sound like a really great solution to my back pain when I'm sitting for long periods of time. Not only are these pillows eye catching but the serve a purpose. I have pain from fibromyalgia so I think this pillow would be wonderful especially on long trips in the truck. Thanks for the chance to win this amazing pillow. I would definitely use this when I sit on the couch after a long day of clinicals! I wouldn't use it when I sleep, but it will be great to use on the couch! I need all the support I can get! I have really bad posture! thanks for the review! This pillow sounds amazing. I have lower back pain usually after walking, standing but I have noticed the more time I spend at the computer also. Would love to try it out and feel better. Thanks for the review. I have back problems and this is a great pillow to help with the problem. I love that you can adjust it so that it feels just right! I love that you can adjust the amount of air in the pillow. It seems that for different chairs, you need different pillows, but this one could be an all in one. I really like that you can deflate it and take it with you. I've gone through so many pillows trying to find one that doesn't kill my neck. This looks like a pillow worth trying! I sit at a desk all day at work and I con't sit back into the seat like I should. I am sure this would really help support my back while I am sitting at my desk. I spend too much time in front of the computer. This pillow would be great to support my back. This sounds really cool. Especially the fact that it can be deflated. I have back problems and the worst chairs in history are at the Dr.'s office! The waiting room, and the exam room never have lumbar support. Being able to have this in my purse for just such situations would be awesome! I like that it can be adjusted to my comfort level. Great product. This is pretty cool! I've never heard of an "air filled" pillow. I like the idea that you can take it with you on the go. I'm curious how difficult it is to inflate. I have alot of pain in the shoulder area of my back (between the shoulder blades) and I've wondered if it is due to the lack of lower back support that I have in my office chair. I'd love to try this out and see how it would work, and possibly help!! I'm not sure if this would be more useful at my computer desk, or in the car. I may have to get two! I definitley thought this pillow was more for sleeping than for sitting, which actually, make me want this pillow even more now! I work as a legal secretary and this "support" pillow i have now, is not exactly doing its job! Would love to try this pillow out! I love that this is approved and recommended by the Board of Orthopoedic Surgeons. I like how it looks like a regular couch pillow. you can adjust it to the comfort that you want by letting out air or adding air to it. I love the fact that I have the ability to change the firmness of the pillow. I would use this on my office chair that is hard and uncomfortable and my back is sore at the end of the day. What I like most about these pillow: it is pillow's air-controlled orthopedic core. With the air unit, it is also very easy to store, allowing you to keep it in the back of the car, or in a drawer in your office! Love how you can boss around that pillow to your comfort zone! This is pretty cool. I like that it can be adjusted to what makes you comfortable. Thank you Susan – for your very thoughtful, honest/candid and therefore very helpful review – especially explaining what this pillow is good/meant for and also it's flaws (I'd much prefer the cotton fabric over the microSTUFF. And since I am afflicted with both acute and chronic neck and shoulder pain – it sounds like this pillow could be very helpful for me in certain situation – and THAT is nothing to scoff at! I like that you can use an air pump to deflate and inflate to the way you like it. This is a neat product and hopefully would help my arthritis. so amazing love the review would very much love to try out this pillow i sit a lot at my computer desk on a wooden chair and not only would it help my bum but would help my lower back as well i have a lot of pain in the lower back . Such a great idea to have a pillow like this sounds comfy and aint a bad price either. This pillow looks amazing and can deff do the job of helping back pain go away or feel better. The style of the pillows is beautiful. this would be amazing for me to keep at work in my office chair. I'm so sick of theback aches from sitting at at desk for 8+ hours a day! Having recently injured my back, this pillow sounds interesting. I like the idea that we can inflate and deflate the pillow to how we want it, plus it looks super comfy. Thanks for the review! I love the fact that this pillow is adjustable. 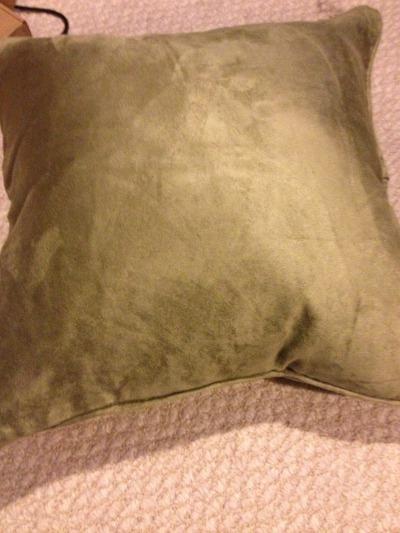 Often times with other pillows, they start off very supportive and lose it with wear and tear. This could be readjusted to be more or less firm depending on my needs. Love it! i use the computer alot and i think this would do wonders for my back that is always giving me issues i suffer from joint mouse so this would probably aid me a ton! What I like the most about these pillows is that they're adjustable. Thanks for the interesting and informative review! I do too admit I sit most of the day and Yes It does do a number on your back. I love how this pillow is adjustabe as I find myself balling my regular pillow up and stuffing it behind my back, I love how I can adjust it just the way I like, no more balling a pillow up behind my back again. Thanks for the review. needs or someone else in your household. This pillow seems like it would be great for my mom, who has fibermyalgia! I really love the air-controlled orthopedic core, i think that is what makes this pillow what it is! Also a great thing about this pillow is being able to be adjusted, that's a great feature! This would be perfect for us when we go on trips in the car or airplane or camping. I would love to try this out thanks for sharing this one and have a great day. I love the pillow would help me so much with my bad back in being able to sit at my desk and in driving my car. Looks really comfy and it nice looking to. My back is begging me for this pillow right now! Since I started working from home a few months back, all the extra time in front of the computer is killing my back (and neck and shoulders), so I'd love to give something like this a try!